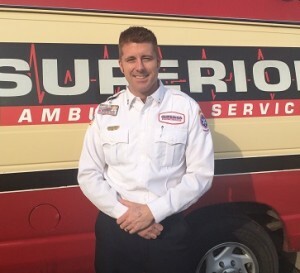 Gregg James is a father of eleven children who serves as a Critical Care Paramedic, Lead Instructor, and Manager of Education Services for Superior Air-Ground Ambulance, the largest prehospital care agency in Illinois. Gregg is a graduate of the Oregon Health & Science University Paramedic Program, where he received an AAS with honors. He has served in EMS since 2002. Gregg began his career as a fireman, where he was actively involved in community and firefighter education. After serving for several years with a 911 medical provider near Portland, Oregon, he moved in 2011 to the Chicagoland area and took up employment with Superior. Gregg’s teaching style and work ethic reflect his strong values of respect and service. Since coming to Superior, he has spoken, with conviction, on the power of value-driven behavior in our industry to nearly 2,000 new employees. In 2015, he oversaw the training of over 800 EMTs and Paramedics. He has helped to develop a new field training officer program to provide novice care providers with more extensive field experience. Gregg is presently Chairman of the Just Culture Committee, a program designed to promote both safety and personal and organizational growth in high-risk industries such as EMS. Superior Air-Ground Ambulance is proud to honor Gregg with the American Ambulance Association 2016 Star of Life.